eD@HoMe: 3 Awesome covers from Malaysia!!! Another 3 awesome covers from Malaysia! Many thanks to fellow blogger, Khor Kok Keong! 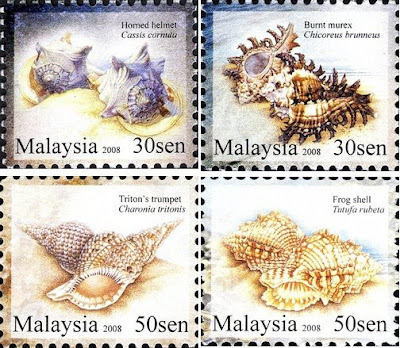 The four gorgeous Seashells stamps with right tabs franked on this lovely cover belong to the "Seashells of Malaysia" series. They were issued on 11 November 2008. They depict Horned Helmet Seashells, Burnt Murex Seashells, Triton's trumpet Seashells and Frog Shell. 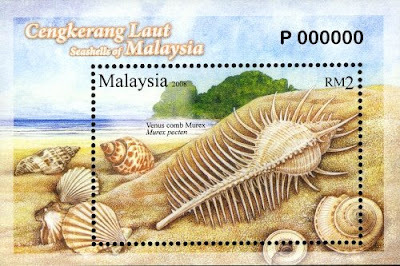 In addition to these 4 stamps, a RM 2 denomination stamp, featuring a Venus Comb Murex Seashell completes this set. The second cover is a FDC to commemorate the 35th Anniversary of the Establishment of Diplomatic Relations between Malaysia and the People's Republic of China. It was issued on 31 May 2009. The limited edition of 100,000 covers is available at RM2 each and bears a 95 sen stamp, the postage rate for a letter to be sent to China. 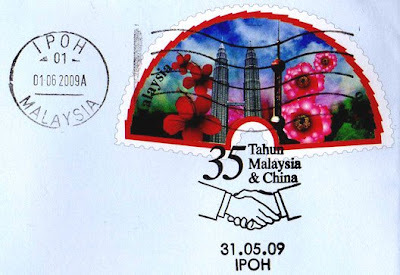 According to Pos Malaysia, the picture on the cover was taken 35 years ago and the stamp was in the shape of a fan with images of the tallest towers in Malaysia (Petronas Twin Tower) and China (Oriental Peral Tower - it was then the tallest structure in China from 1994-2007, when it was surpassed by the Shanghai World Financial Center), besides their national flowers (Hibiscus and Tree Peony respectively). 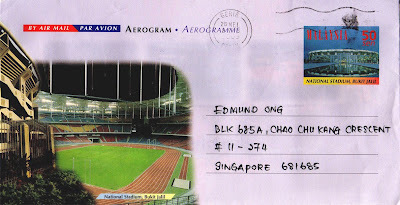 Lastly, we have this beautiful aerogramme featuring Bukit Jalil National Stadium. Located in the National Sports Complex to the south of the capital city of Malaysia Kuala Lumpur, it is a 100,000 capacity all-seater, multi-purpose stadium that was built in 1998 to host the 1998 Commonwealth Games. The stadium is considered the best stadium in Malaysia and is the home of the Malaysian football team. Initially built for the Commonwealth Games, the stadium is now used for a variety of events. These covers took 8 days, 5 days and 8 days respectively to reach me. me a message when your done. I will put your link in my blog. Just leave me a message when your done.